VenueMagic DMX+AV is not just your industry standard, it sets the Standard! We’ve combined timeline editing, audio and video mixing and editing and sophisticated DMX lighting control into one complete, easy-to-use package. Then, just for good measure we threw in playlists,programmable sliders, DMX routing, DMX recording, MIDI control, beat detection and a whole lot more. VenueMagic’s video feature allows you to synchronize your light show with any Windows video file. Add your favorite videos in a single VenueMagic track and play them back to back. Supports dual monitors. 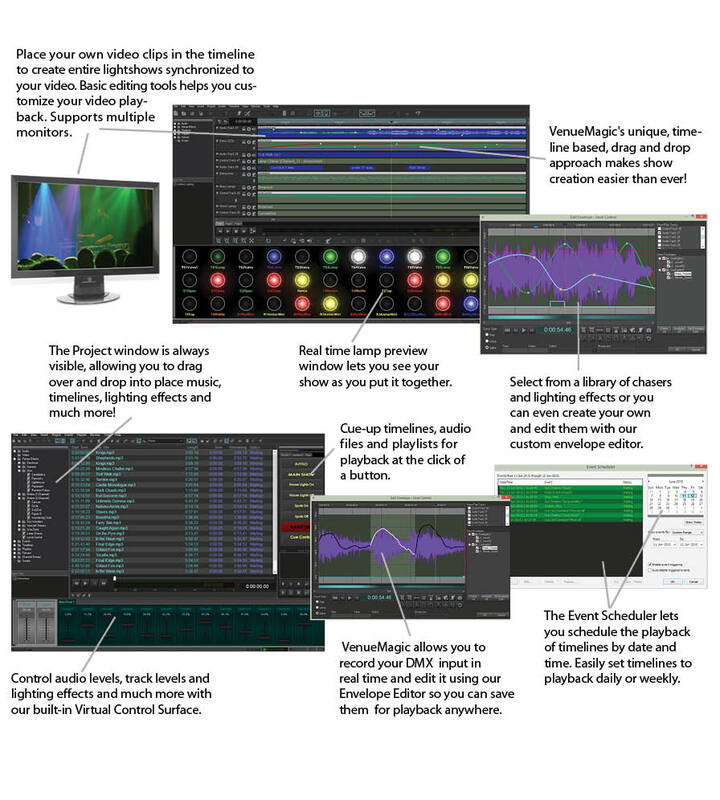 A built in library of lighting effects makes it easy to create your ultimate light show in no time. Simply select the effect you like and drag it onto the timeline where you want it. Invent your own lighting effects using using VenueMagic’s envelope editor. Sync chaser effects to the Beat Tapper to give you complete real time control of chaser sequences. VenueMagic’s powerful multi-track audio editing capability lets you put together your soundtrack inside VenueMagic as you build your show. Layer in effects such as reverb, echo, and flanging. There’s no need to mix down your sound clips using a separate sound editing package. Supports MP3, Wave (.wav) and Windows Media (.wma) files. Command your whole show using your favorite MIDI input device. Cue music and timelines and control light and volume levels on the fly. You can also send your synchronized MIDI events to other MIDI devices. Sync timeline playback to external MIDI clock and MIDI LTC sources. With the VenueMagic Virtual DJ plugin, you can sync-up and control VenueMagic timelines entirely from Virtual DJ through a programmable VenueMagic control console. Works with VenueMagic running on the same computer or remotely over Ethernet. Mix and edit multi-track audio for playback. Control playback, lamp level and audio levels from an external MIDI, DMX or joystick device. Fully automate show playback with the date/time scheduler. Perfectly blend on-the-fly manual lighting adjustments with playback of pre-built timelines. Control other devices using MIDI messages. Timeline markers for labeling important parts of timeline. Easy navigation between markers.